LuxDecor garden is an effective impregnating agent for wood preservation and decoration. The product contains natural waxes that repel water, improving wood durability and strength. Due to gel-like consistency, it is perfect for vertical surfaces. No dripping. Easy distribution. Where to apply? 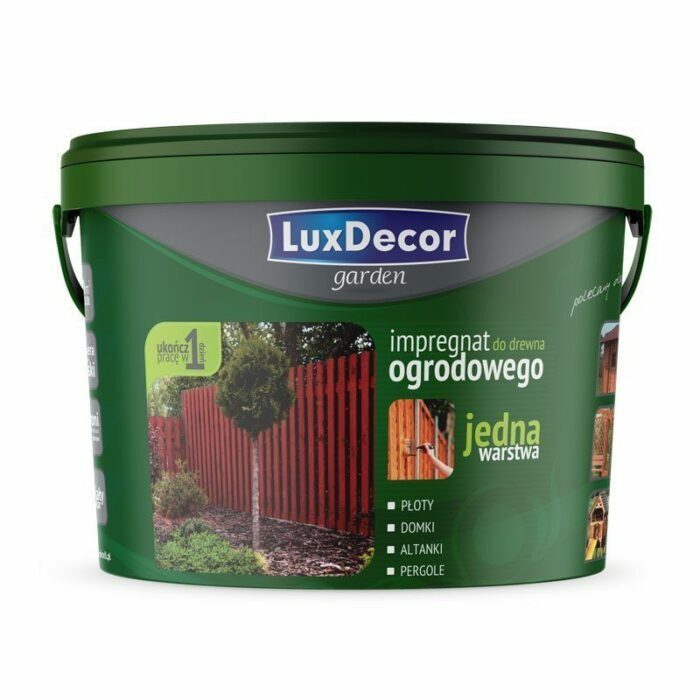 LuxDecor garden is intended for painting garden wood located outdoors: fences, pergolas, gazebos, palisades, picket fences, tool houses, playgrounds, swings, and other garden features. 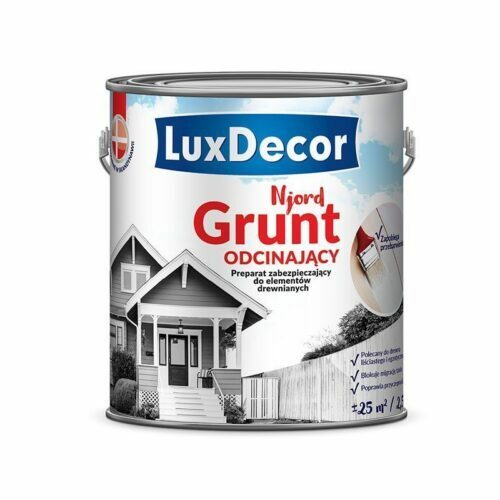 It is particularly recommended for painting unsanded wood. Instruction for use: : The surface to be painted should be dry and clean. 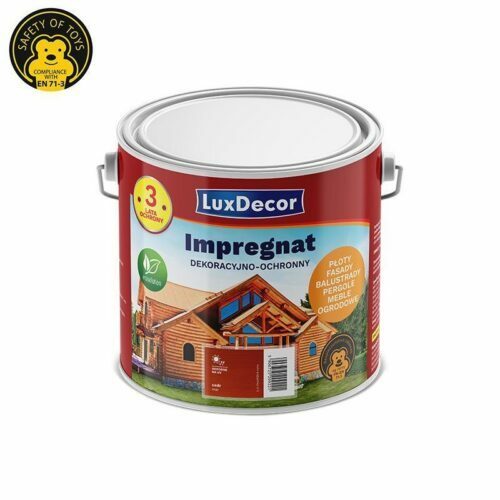 For wood without bio-corrosion protection of industrial impregnating agents, apply an industrial impregnating agent as the primer, e.g. 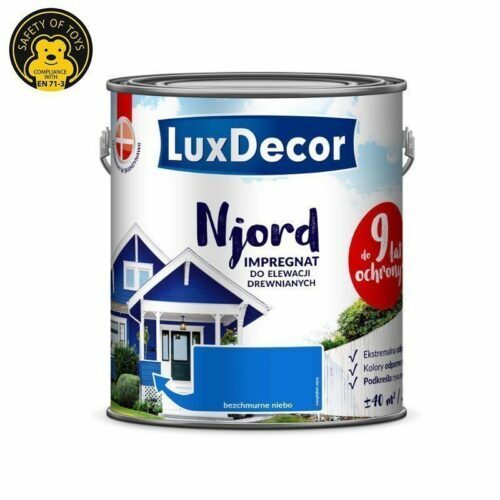 LuxDecor for structural lumber or Primacol Protektor. Before use, mix the product thoroughly. Once stirred, its consistency should be gel-like or thick fluid. Apply the product generously along growth rings using a brush. Important! The colour of the product on the packaging (in the liquid form) differs from the colour once painted and dried. 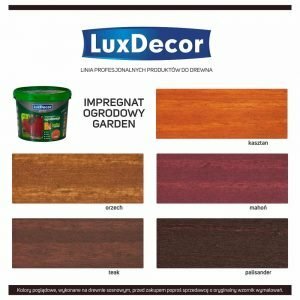 Decorative effect: The impregnating agent creates a decorative coat which is matt and partially covers wood grain pattern. The effect is obtained once one layer is applied. However, if necessary, another layer can be applied (approx. 1-2 hours after the first layer). Due to the limitations of the printing technology, the colour presented on the label is approximate. The final colour to be obtained depends on many factors such as the type of wood, the type of tools used, and the ground coat colour. To check the final effect, make a spot test. Individual batches of the product may slightly differ in terms of colour shades. Using products from the same batch is recommended. Do not paint if air humidity is high and at a temperature below 10oC. Storage and transport: Transport and store in the original, tight container within a temperature range of 5°C to 30°C. Protect from frost. Store in a dry and airy area. Important! Keep out of the reach of children.